Jinchuan Group Co., Ltd. is a large-scale nonferrous metallurgy and chemical joint enterprise, which produces nickel, platinum, copper, cobalt, rare precious metals and chemical products and deep processing products of non-ferrous metals, in which nickel and platinum group metal production account for more than 90% in China. It is Chinese largest nickel-cobalt production base and the third largest copper production base. As a metallurgical-based large company, heat transfer equipment is essential for Jinchuan Group. Hofmann(HFM) has wealthy heat transfer experience in metallurgy, can provide suitable heat transfer programs for Jinchuan Group to ensure the smooth operation of metallurgical engineering. On the basis of extensive verification and research, Gansu Jinchuan Group decided to invest and build an annual output of 15000t sponge titanium smelting project, which marks the Jinchuan Group began to enter the field of rare metal smelting. Since 2002, Jinchuan Group has put forward the idea of entering the field of rare metal titanium, and done a lot of work. At the beginning of 2006, after investigated and surveyed both domestic and foreign titanium industry, Jinchuan Group decided to let the United Nations well-known research institute do the overall design of titanium sponge production process. In the end, the National Development and Reform Commission approved the Jinchuan Group investment in Kenya Quarry titanium project. During the agreement period, Jinchuan Group had a total of at least 400,000 tonnes of rutile and 226,000 tonnes of zirconium, which would provide high quality raw materials for the Sponge Titanium Smelting Project. The project is the first domestic sponge titanium smelting project based on high quality natural rutile raw materials, with the full support of Gansu provincial government. Jinchuan Group sets up a rare metal smelting plant to ensure the smooth operation of the project. Heat exchanger unit in Jinchuan Group Co., Ltd. Sponge Titanium smelting project use heat exchange solutions and plate heat exchanger unit which are provided by Hofmann(HFM) to meet the needs of the metallurgical industry,. Based on the rich experience accumulated in the field of metallurgy and heat transfer, Hofmann(HFM) has developed a more reliable and energy-saving solution for this sponge titanium smelting project. 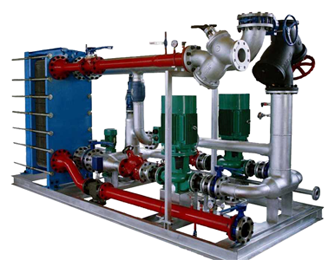 Hofmann’s(HFM’s) plate heat exchanger unit provides one-stop heat transfer service to meet the two kinds of heat transfer requirements (conveying medium is 160 ~ 290 ℃ superheated steam or 130 ℃ high temperature hot water). Metallurgical industry is always one of the most widely used field of heat exchanger, Hofmann(HFM) participated in Jinchuan Group Co., Ltd. sponge titanium smelting project not only has accumulated experience in the metallurgical heat exchange field, but also puts wisdom Into the Jinchuan Group. The project has been accepted by the Jinchuan Group, in the next few years, Jinchuan Group has signed a number of heat exchanger projects with Hofmann(HFM), and maintained a good continuous cooperative relationship. Hofmann(HFM) strives for perfection in every heat transfer project, so that customers can make long-term cooperation in the field of heat transfer supply partners.